Where is Your Favorite Supplement on This Map? 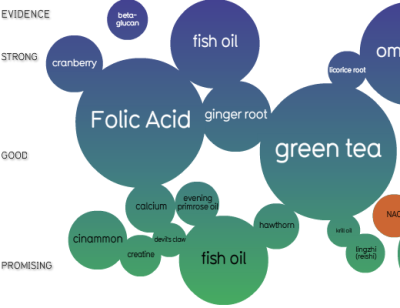 This is an interesting data map of popular supplements, rating them in popularity based on Google hits, and evidence for their efficacy based on research – with an ability to select on condition and type (check out the right hand side of the chart). This is a creation of Informationisbeautiful.net, a great site if you are a data wonk. Pat fish dry and cut into 2 serving pieces. Combine oil and lemon juice in a baking dish. Add fish and turn to coat both sides. Sprinkle with basil, pepper and salt. Overlap tomatoes in even layer on fish and sprinkle with Parmesan cheese. Cover with foil and bake at 400 degrees, about 10 to 15 minutes or until fish just begins to flake when tested with a fork.